Throughout history, Amethyst has been one of the most popular and mystical of all gemstones. Its use in very rudimentary jewellery can be traced back as far as the Neolithic period (approximately 4000BC), and samples of it set into gold rings have been uncovered in burial sites from around 2400BC. Amethyst is the name given to purple Quartz and some believe that its name derives from the Greek word “Amethustos”, “A” meaning “not” and “methustos” meaning “to intoxicate”. In ancient times, wealthy lords who wanted to stay sober were said to have had drinking glasses or goblets made from Amethyst. While pouring wine for their guests they could serve themselves water, as the dark purple hue of the gem would disguise the colour of the drink so it looked like wine, thus allowing the lord appear to be partaking in a tipple! Following the same theme, it was thought in ancient times if you wished to save a drunkard from delirium you could mix crushed Amethyst into a person’s drink. One legend from Greek mythology tells the tale of Dionysus, the god of intoxication, and a young beautiful maiden, named Amethystos, who refused his advances. Dionysus let loose fierce tigers while Amethystos was on her way to pray to the goddess Diana. Before they reached her, Diana turned her into a statue of pure Crystalline Quartz to protect her from the advancing tigers. Humbled by Amethystos’ resolution, and horrified at what he had almost done to her, he wept tears of wine. Legend says his tears turned the colourless Quartz purple, thus creating Amethyst. Amethyst is mentioned in the Old Testament as one of the twelve stones representing the twelve tribes of Israel and was also one of the twelve gemstones adorning the breastplate of the high priest Aaron (Exodus 39). With its association with piety and celibacy, Amethyst has been set into rings and worn by Cardinals, Bishops and Priests of the Catholic Church since the Middle Ages. Over the years, along with its use by the Church, the gem has also been cherished by royalty and several pieces can be found in the British Crown Jewels. Amethyst was also known as a personal favourite of Catherine the Great. A bracelet worn by Queen Charlotte of England in the early 1700s was valued at £200 at that time. With inflation that would make it more expensive than the 2007 Diamond Skull created by Damien Hirst! However, shortly after this period a new discovery of Amethyst deposits was made in Brazil, which dramatically reduced the value of the Queen’s bracelet. This provides a good example of how the value of genuine gemstones (just like the stock market) can go up and down based on supply and demand. When mines are eventually exhausted prices tend to increase; as new deposits are found, gemstone prices generally decrease. Amethyst occurs in many shades, from a light, slightly lavender pinkish to a deep purple similar to that of the Cabernet Sauvignon grape. Amethyst is also pleochroic, which means that when light hits the gem, shades of different colours such as reds and blues can be seen from different angles. As there is no single dominant organisation or ruling body relating to gemstones, there are often different approaches to how a gem is graded or named. Many organisations within the jewellery industry for instance refer to Green Quartz as Green Amethyst, while others refer to Green Quartz as Prasiolite, Amegreen or Vermarine! This is a really hot topic in the gem world: some believing that the name Amethyst can only be applied to purple Quartz, others saying if a Quartz’s green colour is derived from heat treated Amethyst then it should be named Green Amethyst and others saying it should be known as Green Quartz or Prasiolite. Most Green Amethyst has been available since the mid 1950s, has come from Brazil and is heat treated and irradiated to produce an electrifying transparent olive-coloured green gemstone. That said, Green Amethyst (or whatever you want to call it! ), has been known to appear naturally in a small mine in Silesia, Poland, and claims of natural Green Amethyst discoveries have also been made in Namibia, Nevada USA, Zambia and Tanzania. Different tones of Amethyst have different prefixes: “Siberian Amethyst” refers to darker Amethyst regardless of whether they are from Siberia or not, normally having a tone of 75-80%; and Amethyst with a more pinkish tone (20-30%) is named “Rose De France“. 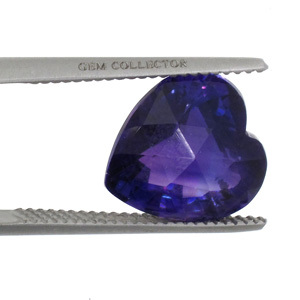 Amethyst is a hard and durable gemstone measuring 7 on the Mohs scale. In its rough state, the gem often forms in long prismatic crystals, making it ideal for cutting. Because its colour can often appear banded, it is usually cut into round brilliant shapes which helps the gem display a more uniformed colour when viewed through the table or crown facets. Amethyst is considered a symbol of peace of mind, modesty and piety. Some believe that Amethyst holds powers to change anger to tranquillity and is used by crystal healers to revert negative energy into positive energy. It is popular for its healing and meditative powers, and purifies the mind, body and spirit, helping to realign the chakras. It is also considered an ideal gemstone for those struggling or recovering from alcoholism as it protects against drunkenness. Amethyst is the birthstone of February. It is also associated with the zodiac signs of Pisces, Aries, Aquarius and Sagittarius. The gem is mined in several countries including the USA, Brazil, Madagascar and Kenya. One of the largest Amethyst mines in the world is in Maissau in Austria and is unusual in that it is open to the public. If you want to travel further, then the Amethyst mines in Brazil are considered to be the best in the world and as long as you don’t mind roughing it a little, you’re sure to have a great adventure visiting the local artisan miners. Amethyst present in crystform in this Geode.